At last, a serving bowl that's equal to summer's freshest picks from the garden or orchard. The handy size is ideal for summer salads. 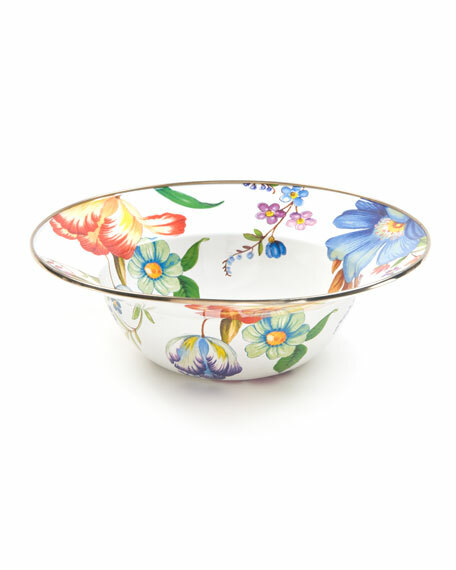 Each Flower Market Serving Bowl is color-glazed enamelware with hand-applied fanciful botanical transfers on both sides that recall a lush English garden in the peak of summer. Pair with a Flower Market Serving Platter for a gift that's not likely to see the inside of a cupboard anytime soon. Serving bowl with heavy gauge hand-glazed steel underbody. Embellished with hand-applied floral transfers.